In search of something to read and not really feeling in the mood for anything on my tbr shelf a few weeks ago I decided to take a trip to my local library. It's a very small library and has less YA books than I do (and my collection isn't particularly big) so I wasn't expecting much but it would seem they've got a few new things in since I was last there, one of which being Everybody Sees The Ants. Immediately I had Ariel Bissett's voice in my head saying it is one of her 'all time favourite books' and thought I couldn't pass up the opportunity to read it knowing that. I can definitely see why Ariel loved this book. It follows Lucky, a target of some traumatising bullying as his mother and himself spend a few weeks in another state to get away from the bullying and the arguments between his mother and father. Lucky searches for his grandfather, pronounced 'missing in action' from the Vietnam War, in his dreams and spends his waking moments trying to deal with all the struggles he faces. 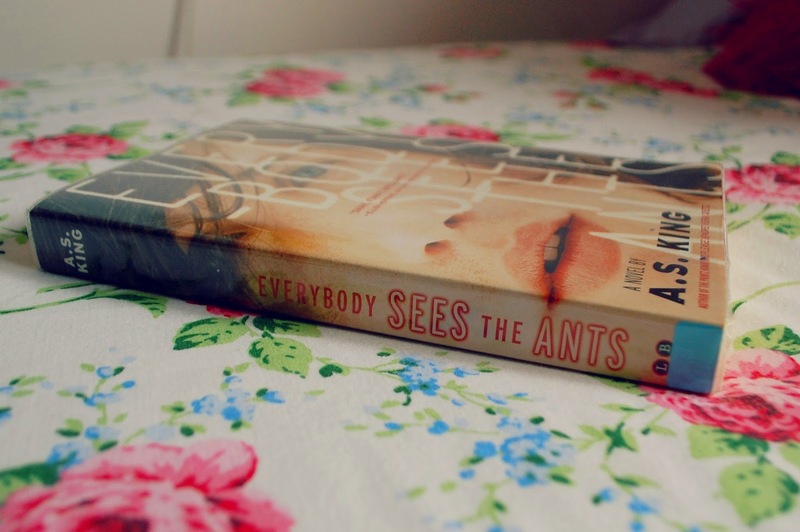 The ants, as referenced in the title, are his conscience that he sees mocking people, including himself, with things he is too scared to say. This book is brilliant. I found the dream sequences and the ants incredibly unique and the book itself was just amazing. I'd definitely recommend this one to pretty much anyone! Have you read it? What did you think? Let me know in the comments below!